No matter how advanced you are in your office or work environment, there is something essential that everyone should own: the humble pen. The pen works in virtually all circumstances and environments, letting you jot down notes easily enough or scribble an important piece of information as and when required. Here is what happens when you give an age old solution a technological boost: the Zanco S-Pen from Zini Mobiles. 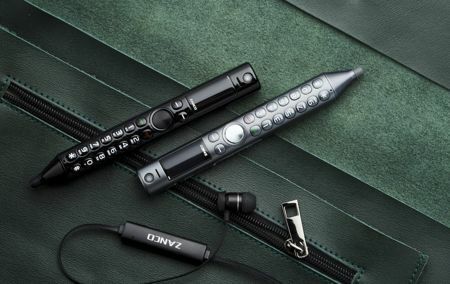 While smartphones continue to get larger in size as well as more complicated in their functionality, here is the Zanco S-Pen that might help streamline the busy executive’s life. This is an all-in-one pen phone and presentation tool that is jam-packed with features, making it suitable for both work and travel. Your presentations will never be the same again with the built-in laser pointer, letting you showcase the points that you would like to get across to your audience in clarity. Need to jot down that important piece of information but do not have a piece of paper? Fret not, there is always the built-in voice recorder that gets the job done, and even then you can always fall back on the front- and rear-facing 5MP cameras to snap a quick photo. Since it connects to your smartphone over Bluetooth, it can also be used to monitor and decline calls in order to prevent any disruptions in important meetings. The S-Pen will also double up as a universally compatible stylus pen for easy and accurate writing, where it can alternatively be used as a drawing tool for graphic design. Arriving in its compact form factor, the Zanco S-Pen is the ultimate compact backup phone for travel, outdoor activities emergency situations, or virtually anywhere else where a large smartphone is simply impractical for use. All data will be stored onboard an SD memory card, and the built-in rechargeable battery is able to deliver up to 6 days of standby time on a full charge. Next articleWordPress 5.0 is here!